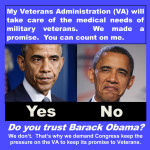 This sums up why the VA Accountability Act proposed by Congressman Jeff Miller should be enacted by Congress. 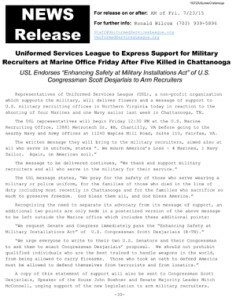 Uniformed Services League (USL) announced its endorsement of the VA Accountability Act today, introduced by Congressman Jeff Miller, Chairman of the Veterans Affairs Committee of the U.S. House of Representatives two weeks ago in April, and will unveil a petition drive to demand passage of this bill at its free May 20 conference (7:30 to 9 PM, doors open 7 PM) devoted to the theme of the broken promises by the Obama Administration to American veterans. The Conference will be at the Hilton Garden Inn Fairfax on Route 50 near I-66, 3960 Fair Ridged Drive, Fairfax VA (advance RSVP required). Congressman Miller’s legislation would give the Department of Veterans Affairs Secretary sweeping new authority to fire corrupt or incompetent employees for cause and comes after no VA employees have been fired in the scandal which was revealed one year ago. Congressman Jeff Miller released this statement in support of his proposed legislation. “More than a year after enduring the biggest scandal in VA history, in which 110 VA facilities maintained secret lists to hide wait times, the department hasn’t fired a single employee for wait time manipulation. Even worse, rather than disciplining bad employees, VA often just transfers them to other VA facilities or puts them on paid leave for months on end, ensuring taxpayer money is wasted and that bad employees spread their problems to other locations. From Philadelphia to Reno, Nev., to Nashville, Tenn., to Phoenix, VA’s tradition of transferring problem workers, putting them on paid leave or simply allowing them to go virtually unpunished continues because current civil service rules make it extremely difficult to properly hold employees accountable. I know this because high-ranking VA officials – people who work directly for the secretary – have told me so behind closed doors. “The department’s overwhelming lack of accountability in the wake of the VA scandal is precisely the type of situation that makes the average citizen lose faith in their government and causes quality health care professionals to think twice when considering to work at VA. After all, why would anyone want to work for an organization where corrupt behavior that harms veterans is not only tolerated but often goes virtually unpunished? To extend your support for this cause you may attend the conference on May 20 with keynote remarks by Dr. Johnny L. Simpson, Jr., himself a paralyzed veteran who has done battle with the VA for the medical care it had promised him during his military service. Dr. Simpson will speak in behalf of Uniformed Services League and describe specific cases where he has worked to secure the care promised but still not delivered to American veterans. The May 20 Conference will be the first opportunity to sign the new “Petition for VA Accountability” circulated by Uniformed Services League with attendees to be urged to help by taking petitions home with them for circulation. To reserve a free ticket to attend the “Support VA Accountability Act” Conference on May 20, sponsored by Uniformed Services League, click here. To access (view and/or print out) the conference flyer, here. For last article about the May 20 conference scroll down or click here. 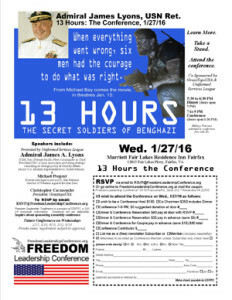 Those who are interested in extending strong support for the work of the Uniformed Services League and to meet and discuss this issue with the keynote speaker and conference leadership may attend the private dinner from 6 to 7 PM (doors open 5:30 PM) at the Hilton Garden Inn. There is a discount for dinner tickets paid for in advance of the conference (deadline next Monday, May 25, 11 PM). This entry was posted in USL News. Bookmark the permalink. 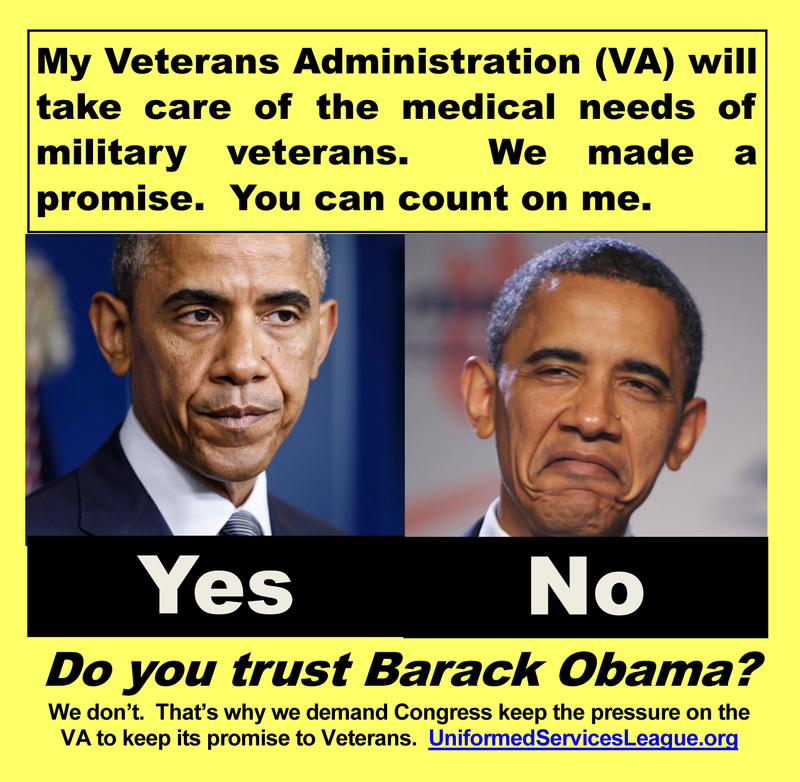 Do you trust Barack Obama?